Kristin Joy Pratt-Serafini first connected her love of art with her concern for the rainforest when she wrote and illustrated A Walk in the Rainforest for her mom’s preschool class when she was a freshman in high school. Since then, she has written and illustrated five other environmentally-focused books for children, all published by Dawn Publications in Nevada City, California. In 2006, Kristin began to work with the Christian Science Publishing Society in Boston, Massachusetts to create a line of Christian board books for little ones. She has illustrated four books for them so far. She loves the opportunity to take a fresh look at familiar spiritual texts, and help make them accessible to small children. Whether making books for editors on one coast or the other, Kristin hopes her colorful paintings will get kids excited about going outside, thinking, and exploring the world for themselves. Lauded as a young “Eco Star” by the Cousteau Society, and inducted into the Kid Heroes Hall of Fame by E: The Environmental Magazine, Kristin Joy Pratt demonstrates not only an infectious love of nature that promotes environmental awareness among children, but also a “can do” positive attitude toward life that has helped make her so popular. 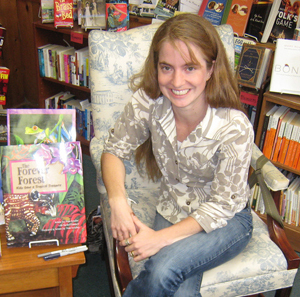 Kristin’s best-selling first book, A Walk in the Rainforest, written in 1991 at age 14, began as an English homework assignment. More than 130,000 copies have been sold. Perhaps Kristin had no idea the size of the step she was taking, but her attitude was right for a great leap. She had learned how quickly a key global resource, the rainforests, were disappearing. Instead of being awed into apathy, Kristin acted. “I looked at what I had, not what I didn’t have,” she said. “What I have are my abilities to write and to draw, so I decided to use these talents to help.” She worked long hours after school and on weekends, sometimes 20 hours on an illustration to get it right. At age 16, inspired by a marine biology class and her concern about contamination of the world’s oceans, Kristin wrote and illustrated A Swim through the Sea. It was selected as an outstanding book by the National Science Teachers Association and the Children’s Book Council, and like A Walk in the Rainforest, over 130,000 copies of this book have been sold. In 1995, at age 18, Kristin turned the spotlight on the fragile “invisible ocean” of air around us, and wrote and illustrated a third alphabet in the series called A Fly in the Sky. In 2001 Kristin brought attention to the wildlife in our local lakes and ponds in her beautiful Salamander Rain: A Lake & Pond Journal,. Next, Kristin created Saguaro Moon: A Desert Journal, which reveals the wonders the desert habitat to our next generation of naturalists. By now Kristin had become a popular speaker at schools, museums and aquariums all over the U.S., and an inspiration for what even a young person can do given talent and the right attitude. In 2002, Kristin had the opportunity to give back to a high school program that meant a lot to her as a student. The Principia Upper School Teton Trip is a week-long art/science/writing trip to the Teton Science School in Jackson, Wyoming for juniors and seniors at the Principia Upper School. It is a chance for students to step away from the petty concerns of school (provided they can finish a week’s worth of homework ahead of time) and think about the big picture. The seemingly disparate fields of art, science and writing are connected through the medium of the nature journal. This trip taught Kristin a lot about the meaning of commitment, observation, and curiosity. She was thrilled to be asked back as an instructor, and has taught either art or writing on the trip in 2002, 2004, 2006, 2007, and 2008. Kristin also had the opportunity to teach a couple of journaling courses at Arts for the Soul in 2004 and 2005. AFTS is an arts retreat for retired adults in Steamboat Springs, Colorado. After the first year at AFTS, which was also her 2nd year teaching on the Teton Trip, Kristin wished she had a better way to share some of her own journal art. She did a lot of research about self-publishing, and found a fantastic company called Lulu.com. At the end of 2004, she published Words With Wings: The Private Journals of an Artist, Vol. 1, which is a compilation of her favorite pages from her journals of 1994-2004. Welcome to the revolution of print-on-demand publishing. Kristin was so excited with this new technology that she published two more books through Lulu.com in 2006. Letters to Mozart and Papa’s Opera are both the result of an invitation to contribute to a 250th birthday celebration for Mozart put on by Emerald City Opera in Steamboat Springs, Colorado. In addition to the two books, Kristin’s year-long study of Mozart launched a series of acrylic paintings on canvas. What a thrill to stretch out on a huge canvas after doing small illustrations for so long! This is something she hasn’t had a chance to do since college, but she now finds that working on canvas is vital to her progress as an artist, and really improves the quality of her illustrations. After completing 15 Mozart-related canvases, Kristin continues to paint on canvas whenever she can, which is mostly between book projects. You can have a look at her paintings at ComplicatedOctopus.com. Also in 2006, Kristin began to work with the Christian Science Publishing Society (CSPS) in Boston, Massachusetts to create a line of Christian board books for little children. She realized there might be an opportunity to take her art in yet another direction when she took her mom out for Mother’s Day brunch in 2005. Ever observant of new possibilities, Kristin’s mom asked her why she wasn’t making books for the kids at church. It was true that the CSPS hadn’t released many new books since Kristin was in Sunday School herself. Good idea! What books would she make if she had the chance to work with the CSPS? She immediately thought of the hymn called “Feed my Sheep”, a well-loved lullaby hymn written by Mary Baker Eddy, the founder of the Christian Science Church. This hymn begins “Shepherd, show me how to go/O’er the hillside steep…” and is sung to little children all over the world by their mommies. She couldn’t believe it hadn’t been illustrated in 120-odd years since it had been written. Thinking of her best friend’s own toddler, Joshua, who was just learning the words himself, she did a few sample illustrations, and sent them off to Boston. Within the next 18 months, Shepherd, Show Me materialized as a 24-page board book; by Christmas 2006, Joshua held his very own copy in his little hands. From her centrally-located base in St. Louis, Missouri, Kristin discovered the fun of working for an editor on each coast – at the same time! 2007 was unquestionably a fruitful year. The new partnership with the CSPS proved to be a good match, and Kristin is now working on a set of 6 board books called the “Little Ones Series”. The first two “Little Ones” books, Psalm 23 and The Lord’s Prayer were released in 2007. Kristin has found it a great blessing to take a fresh look at familiar spiritual texts, and help make them accessible to small children. As soon as she had finished her complicated artistic entanglement with Mozart, Kristin began working on a new book with Dawn Publications. Kristin first proposed the idea of a book celebrating the 20th anniversary of the Children’s Eternal Rainforest in Monteverde, Costa Rica to Rachel Crandell a couple of years ago. Rachel is a retired 2nd grade teacher. She is responsible for bringing the rainforest curriculum to Principia, where Kristin was a student. Rachel also started a non-profit called Monteverde Conservation League, U.S., which raises funds to help support the Children’s Rainforest. Dawn Publications accepted the idea at the beginning of 2007. Kristin and Rachel worked out a co-author arrangement, where Kristin would write the main story (and do the illustrations), and Rachel would research and write the scientific information about the different species mentioned in the book. The Children’s Eternal Rainforest is the same rainforest that originally inspired Kristin to write her first book 15 years ago, so she relished the opportunity to return to the topic (and revisit the actual rainforest!) as adult. Kristin was able to take her camera and paints, and travel to Monteverde with Rachel for ten days at the end of March 2007. She spent her 31st birthday sitting on the porch of Rachel’s cabin on the edge of the Children’s Rainforest, where she illustrated the title page of The Forever Forest. She watched morpho butterflies flit around in the patches of sunshine filtering through the trees. When she was very still, she heard the call of the blue-crowned motmot. Kristin had an excellent opportunity to demonstrate her best time-management skills later that year, as something like 42 illustrations, for 3 books were due in the fall of 2007. Happily, Psalm 23 and The Lord’s Prayer hit the shelves just in time for Christmas, and The Forever Forest had a spectacular Spring 2008 release.